One really important thing was lost for me when I decided to come to Australia. Instead it’s the beach, the sun, the BBQ, short shorts and flip flops. I just can’t relate. I’m already programmed. In an attempt to convince myself that it really is Christmas and most of you are in full swing, I’m doing what I do best – baking! 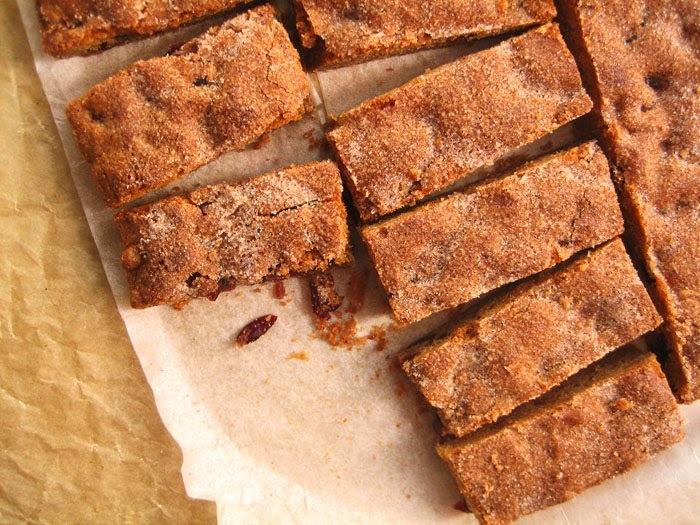 These spicy, chewy bars are practically made of Christmas. You’ll know what I mean when you smell the aroma that fills your kitchen. Cinnamon and cranberries couldn’t be more appropriate at this time of year and these make a great change to the usual cookie. I mean it when I say cinnamon too – 2 ½ teaspoons is serious business. 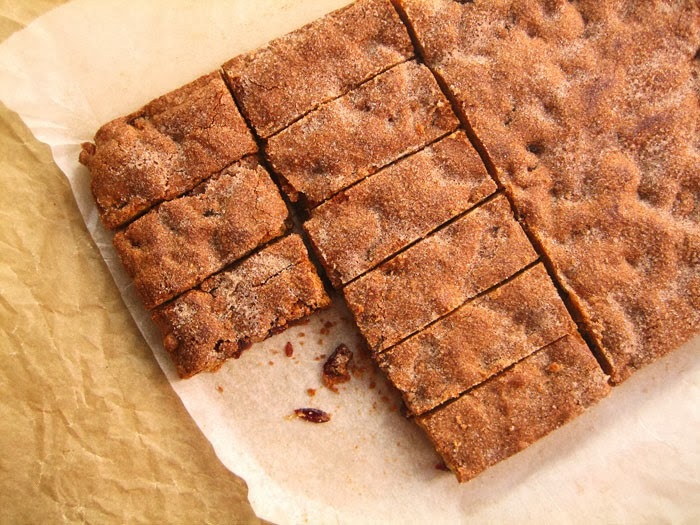 A fair bit of dark muscovado sugar helps to keep them chewy and lends a subtle gingerbread note (minus the ginger). A crunchy cinnamon sugar crust gives them interest and studs of gorgeous cranberries makes them merry. Don’t be shy with the salt either. Although the amount of sugar in this recipe isn’t unusually high, the combination of sugar and a generous amount of cinnamon spice makes these come off very sweet and the salt is necessary to balance it out. Preheat your oven to 350°F. Line a 9x9-inch baking pan with parchment paper and set aside. Combine butter and both sugars in the bowl of a stand mixer fitted with the paddle attachment. Beat on medium-low speed for 2 minutes, until smooth but still dense, grainy and paste-like. We’re not after “light and fluffy” here. Beat in vanilla extract and egg until smooth, then mix in ground cinnamon. Combine flour, salt and baking powder/soda in a separate bowl and add it gradually to the butter mixture with the mixer running on low speed. Once combined, remove the bowl from the mixer and fold in cranberries by hand. Spread the mixture into prepared pan, using your hands to press it in evenly. It helps to wrap your hand in plastic wrap to prevent sticking. To make the topping, combine sugar, cinnamon and oil in a small bowl and mix it together using the back of a spoon to incorporate the oil. The oil will help the cinnamon bind to the sugar. Sprinkle this mixture evenly over the dough in the pan and pat it in gently. Bake about 25 minutes. Let cool completely in pan before slicing into thin bars using a sharp knife. Hi Kris, muscovado sugar is a type of unrefined brown sugar. 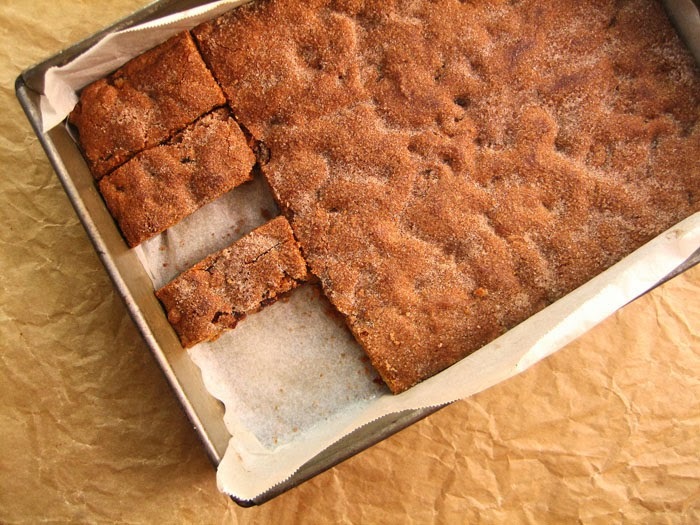 It has a slightly coarser texture and darker, richer molasses flavour than regular brown sugar. You can, however, substitute with dark brown sugar and add 1/2 tsp molasses if you like. That is a lot of cinnamon...but I love cinnamon! On a cold winter day the sound of your plight is particularly appealing!